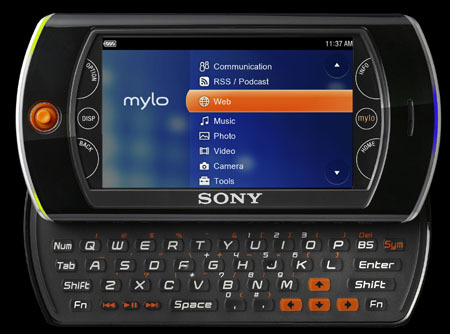 CES Sony has revamped its Mylo - My Life Online - internet access handheld, enhancing the Wi-Fi gadget's support for teen-friendly social networking sites and the like of YouTube. Gone is the toy look of the previous Mylo, replaced with a more serious look that might almost appeal to business users. The slide-out Qwerty keyboard's still there, but now it'll connect to 802.11g wireless networks as well as 802.11b WLANs. The display is now a larger 3.5in job, up from the previous model's 2.4in screen. 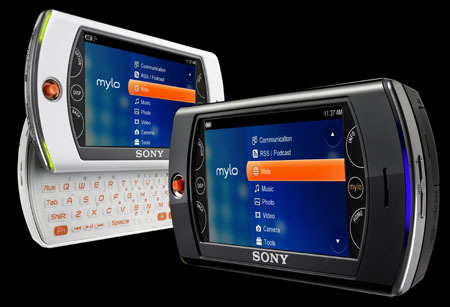 Sony's Mylo: no longer a toy? It has 1GB of memory, and there's a Memory Stick Pro Duo slot for more – handy for keeping the WMA tracks the device now plays. It'll breeze through MPEG 4 videos too. Skype's still part of the package, but now the gadget supports AOL, Yahoo! and Google instant messaging networks. The system software gains Adobe Flash Lite 3, allowing Mylo to play YouTube videos, and photo-tweaking code to adjust snaps taken using Mylo's 1.3-megapixel camera and upload them to Facebook. It can host Google Widgets, too, which provide contacts management and tie into the social networking sites. Sony promised to post Widget creation tools at the end of this month, though users will have to register as developers to get them. Expect the gadget to come with Flash-based games and for Sony to offer plenty more for users to pay to download. Alternative face-plates too, now they're removable. Sony claimed the new Mylo's battery is good for 20 hours of music playback, six hours' Skyping or seven hours' video watching. Mylo will ship in the US later this month for $300.